Before choosing to download one or more of the templates listed below, make sure you select those for which you have the right program. The first two templates are compatible with Microsoft Word 2007 and 2010, as well as Word 2003 provided you have the Office Compatibility Pack installed. The final two templates work with all current versions of Microsoft Publisher. Click on any image to enlarge it, and click the Download Link to go to the download page for the corresponding flyer template. Once you download the flyer, it will open in Word or Publisher so that you can modify it for your cleaning service. This flyer for Microsoft Word features a cartoon man who appears to be stressed out and overwhelmed. He is loaded down with a briefcase, files and other work-related bulk. Above him, the flyer states, "You have enough to deal with" and "Let us handle the office cleaning" below him. There is a text box on the lower right in which you can enter your contact information and a clip art image of a mop and bucket in the lower left. This office cleaning flyer is for Microsoft Word. It features the silhouette of a man cleaning a window in shades of green, which you can recolor using the options on the Format Picture toolbar in Word 2003 or the Format tab under Picture Tools in Word 2007 and 2010, if you choose to do so. 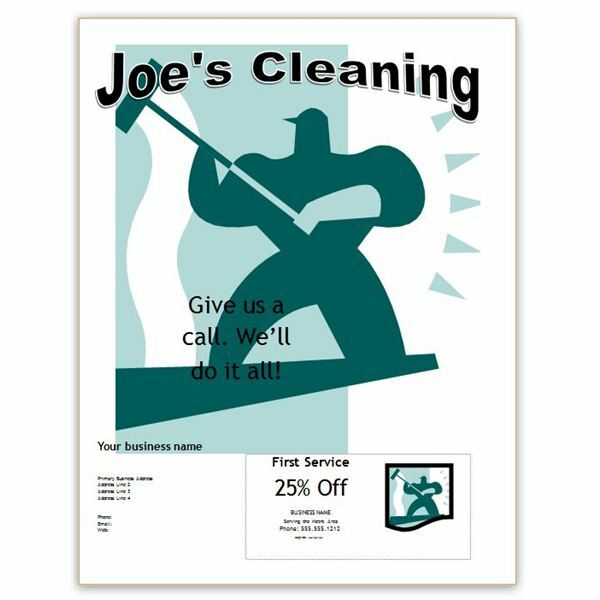 The words "Joe's Cleaning" are a WordArt image, so you can easily customize the text to meet your needs. There is a coupon at the bottom of the page with a dotted line border for potential customers to snip and use. In order to access the text boxes in the coupon, you will need to send the box with the dotted line to the back or move it out of the way first. Other text boxes include a box for your motto or tag line, one for your business name and boxes for your contact information. 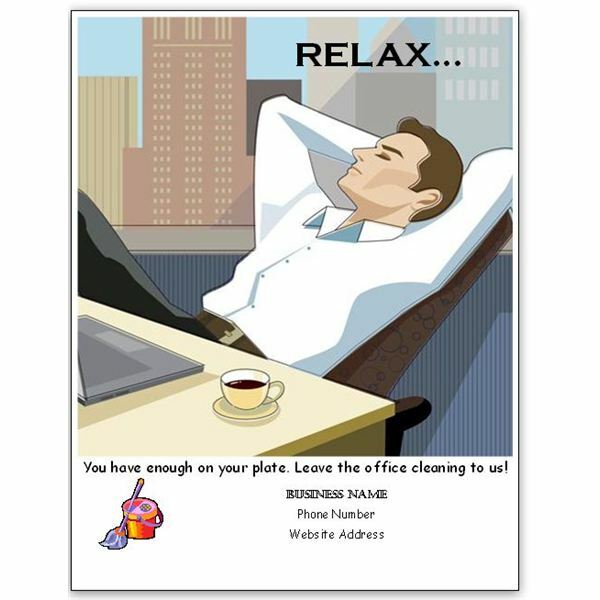 This flyer template is for Microsoft Publisher and features a businessman reclining in his office chair. The flyer reads, "RELAX… You have enough on your plate. 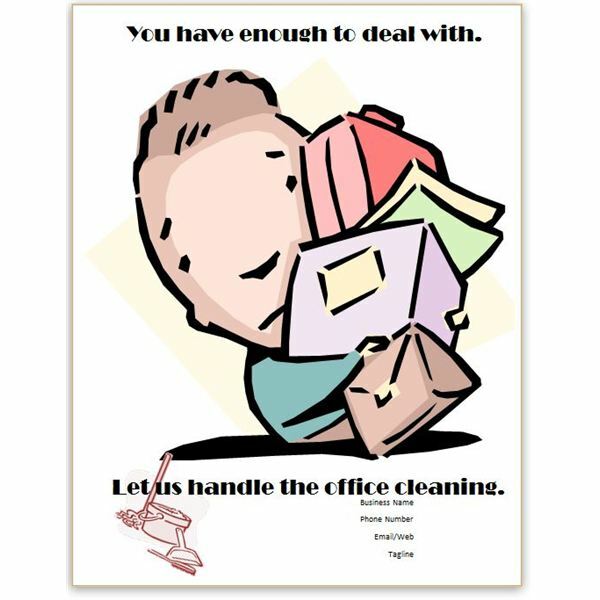 Leave the office cleaning to us!" There is a text box into which you can type your business name and contact information in the lower right side of the flyer. There is also a clipart image in the lower left side of the flyer. If you would like to replace this image with your own logo or another picture you have on file, simply right-click the image and select Change Picture. Navigate to the image on your computer and replace it. 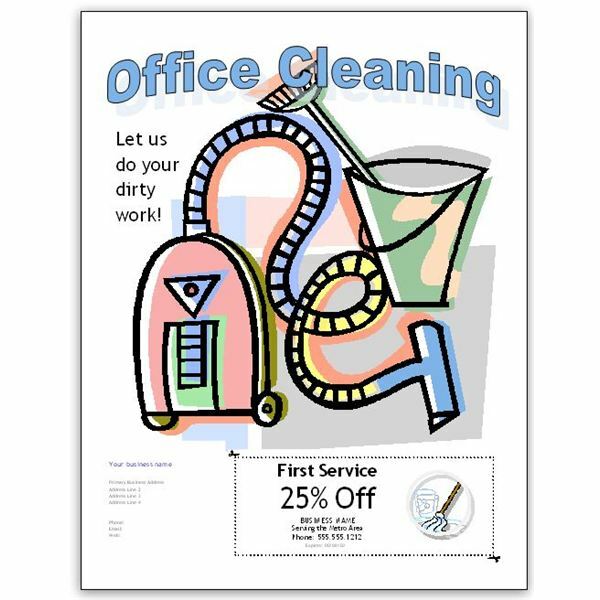 This office cleaning flyer is for Microsoft Publisher. It features a brightly colored collection of cleaning tools and the words "Office Cleaning" as a WordArt image that you can easily customize to meet your needs. There is a coupon at the bottom of the page with a dotted line border for potential customers to snip and use. Other text boxes include a box for your motto or tag line, one for your business name and boxes for your contact information. Check back often as articles are updated and new templates are added over time. If you have an idea for a template not shown here, please leave a comment below. Check out the Microsoft Publisher library on Bright Hub for many other templates and helpful tips. Screenshots and flyer templates courtesy of author.